Leela is transferring Fry's memories into the robot. Robot Fry is a robot who was built by Turanga Leela to replace Philip J. Fry after his "death". At the end of Into the Wild Green Yonder, the Planet Express ship goes through the Panama Wormhole and exits in Earth orbit. The ship is shot by Zapp Brannigan's flagship Nimbus and thus losses power. The ship crashes in front of the company headquarters, killing all the crew except the Professor and Leela who was saved by Fry. Saddened by Fry's death, Leela builds Robot Fry at a Build-A-Bot Workshop. 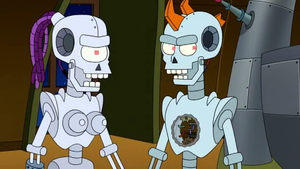 Robot Fry was programmed to love Leela after she uploaded his personality from surveillance tapes, this also made him look the same as the real Fry. Unfortunately, due to excess wiring in his stomach, he short circuited killing Leela and wiping both of their short term memories. Then, thinking he is human, he goes on to build a Robot Leela. When the originals are rebirthed the two robots shed their skins, change voices for some reason, and then leave. Robot Fry: [While taking off human skin.] Hasta la vista, wiener. This page was last edited on 6 October 2015, at 21:08.